I love the Baby Show! I look out for fliers all year - because invariably different companies will be offering differing levels of discount - I wait like a cat ready to pounce when I find the lowest discount! This year I could have had between £3 and £6.50 off the entry price and I almost succumbed - but holding out for another week paid off. I managed to get a two-for-the-price-of-one deal... so HRH could come for free lol. Now he had no excuses. We dropped the princess off at ballet and, with the young prince in tow, headed across the river. The Baby Show is probably the largest baby product exhibition in the UK, not only will you find toys, nursery furniture, bedding and feeding products; there is a wealth of information available and exhibits showcasing natural alternatives like cotton nappies and skincare products. Keep going and you'll find branded maternity and baby clothing; baby slings, books, and vitamins plus there are experts on hand to discuss cord blood capture, cell preservation, antenatal care, pre and post natal health, weaning, sleep, developmental milestones, breastfeeding, early years education and so much more. The keys to getting the most out of the show? If your partner is grumpy and inclined to rush you (i.e. get super miserable after 2 hours of walking and looking and comparing) - LEAVE HIM AT HOME. Take your best friend or your mum instead. Get there early - the crowds will be smaller. There are areas for discreet breastfeeding, facilities for bottle (and food) warming and booths from which you can buy ready to drink milk formula (in cartons) and organic baby food so you can afford to travel light. Last time I went there were even free disposable nappies to use at the Pampers and Huggies courts. Try to plan your time so that you have about 3 hours - if you leave earlier you wont make the most of the exhibition (nor will you have gotten your money's worth out of the ticket!). If you stay longer - you are going to be exhausted (especially if you are pregnant) because there is a lot of walking to do. Don't worry too much though as they have plenty of rocking chairs and a (pregnant) mummy chill out area where you can catch your breath. Decide how you will get your spoils home. Will you use their home delivery service? Or park and collect (on your way home)? Or will you take your partner and load him up like a camel? (Sorry - couldn't resist). my ideal double buggy at the ideal price. a set of reusable nappies at a better price than I can find online. SOFT biodegradable nappy liners (these are like gold dust!). Anything else would be a bonus! I bought the nappy bundle first - once again choosing to go with BumGenius V3 Birth to Potty nappies, I did go with an open mind, and was prepared to be persuaded to purchase an alternative (and potentially cheaper) brand - but after listening to a lot of impartial advice and my own observations etc. - BumGenius came out tops for my budget and lifestyle. At a RRP of £14.75, I was pretty happy to get my bundle of 15 at a 20% discount. Research also played a key role in my choice of buggy. Faced with the 'lovely' prospect of having two little ones under 2 (and bother under 18 months for a while! ), we reluctantly reached the (obvious) conclusion that we'd have to say goodbye to our faithful Quinny and buy (what we saw to be) a bulky, clumsy tanker. Over the past 7 months I have tirelessly trawled through the internet and read every product review (printed or otherwise) I could find. HRH also didn't like the idea of baby #3 being so close to the dirt and dust of the road. So we ruled it out. If you like it - you can get one for around £350. So that'd be the price to beat at the Baby Show. Standard side by side strollers were ruled out - we do a lot of outdoor activities and those peeny wheels would never cope with the mud, gravel and grass we like to roll over! We also go to Barbados quite frequently and those little wheels would get stuck in the sand at the beach. These babies cost about £220 and up. These tandem pushchairs were also out of the question: too massively bulky, they'd never fit in the car and are difficult to steer. We also didn't like that the kid in the back can't see much. I mean - what's the point in going for a walk when all you can see is your brother's seat? You'd get a crick in your neck from constantly holding your head to the left or right. I also had difficulty collapsing them and lifting them - so no good for petite people. Who wants to have to call HRH everytime you need to close/open the buggy? Expect to shell out £390-400 depending on where you go! So what did we settle on? The Out-N-About Nipper 360 double (yes a ridiculously long name) but the thing scored top points with (the notoriously hard to please) HRH, particularly with regards to manoeuvrability, ease of folding and size when folded. (If you follow the link, make sure you read the reviews and click on the videos). Again, don't be fooled by the photo, it isn't that much wider than a standard (single) pushchair and IS narrower than most side by side double buggies (which is what we want). Both kids have 'equal viewing rights' and of course, each seat can be raised/reclined independently of the other. I could fold this down pretty easily - especially considering the super fat belly I have AND once folded I could also lift it up pretty easily too. I like the Baby Show because exhibitors always bring a WIDE variety of items, so you can really try before you buy and compare your shortlisted items against eachother. If this buggy hadn't lived up to all its positive reviews etc, I could easily have walked away. I'm just glad I didn't have to. RRP is around £348, most on-line stores come in around £330. I haggled and got it under £300 with a few extras thrown in. I'm very happy with that. I also got some bargains on Tommee Tippee bottles and cups and would have grabbed a lot more nifty gadgets and toys had HRH's patience (and parking ticket) not run out. Heeheheh. So, I've come away with the key items I was searching for, lots of information on natural baby products, (with brochures so I can buy on-line as I didn't have time while I was there - HRH's orders) AND a massive bag of pick-n-mix sweets to satisfy my midnight cravings! If I had the time, money and unction - I'd go back tomorrow and see what else I missed... but that would just be silly. When the buggy does arrive (well and the baby of course), I'll let you know whether it was really worth it... and how it fares in Barbados. The Quinny did a fantastic job last year - beaches, pot holed back roads, grassy verges, the lot. Big wheels make a BIG difference. Since you can use this with the Maxicosi car seat - we'll keep this for when it's just me and the newbie (i.e. baby # 3); or just me and the young prince - but when we're out as a family - we'll have to use the (new) double buggy. 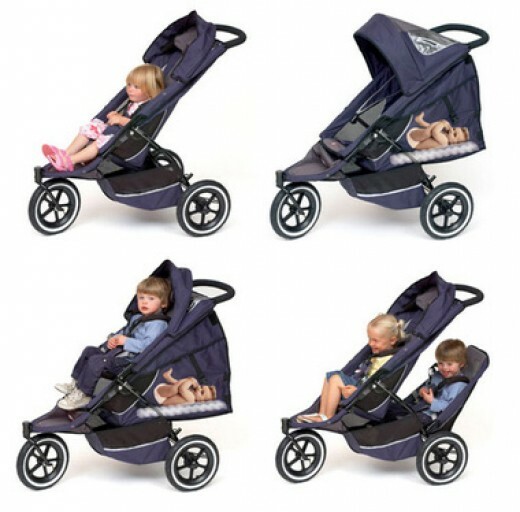 Oh and where's your review of the Maclaren one you can fold with one hand, while holding a baby in the other? :)"
they're not double buggies Mit - no use to me. Wow, this is some serious research - definitely a mum on a mission! The Nipper 360 looks good - hopefully it's not too heavy. This is nice.. We are also planning to take some vacation in Barbados and I'm now searching for an affordable hotel in Barbados for my family. Why Can't Men Close Their Legs?